Felix Nadar was a legendary and dynamic personality. Born in the year 1820, in the city of Paris, he worked his way to fame as a journalist and caricaturist. He was a man of many talents. He was a writer, cartoonist and also a top secret agent for France before turning his attention to complex portraits and celebrity photography. Did you know that he was the first international celebrity photographer? He used to create mind-blowing and complex pictures of popular art personalities, writers and actors of the 19th century. It was a fact that he was enthralled by celebrity culture and their popularity. Historical photography journals hinted of his passion for becoming a celebrity figure himself. To set the stage to fame, Nadar advertised his talent to the public through numerous ways. For example, his name could be read prominently in fine glass tubing and brightly glowing neon lights over his remarkable photography studio. His real name was Gaspard Felix Tournachon, he was fondly called as Nadar by his friends. Felix decided to use the name Nadar as his pet name. He was the co-founder of the classy literary journal ‘The Livre D’or’, at the young age of nineteen. He met famous and illustrious writers and actors of those times and he also exploited the opportunity to the fullest. In 1854, he started an epic project ‘Pantheon Nadar’ with the ordination of four mega-sized lithographs, which portrayed 1200 celebrated personalities. One complete sheet was dedicated to writers, actors, playwright artists, musical celebrities and other artists. The first sheet, depicting writers and journalists, with 250 caricatures in the gigantic lithograph, earned him great honour. Although he suffered financial losses as only 136 caricatures were eventually sold, it earned him great critical fame. The Pantheon Nadar was soon to be the pride of reputed Paris museums and salons. Thanks to the unfinished yet illustrious project, Nadar soon became a household name in his home country. Nadar was fixated on being the first to start incredible technical developments in Paris. He was the initiator of aerial photography. His first aerial picture from a balloon provided man the majestic and unhindered aerial view of the landscapes below. In the year 1863, his photography studio was home to a society devoted to encouraging aerial locomotion. It was called “The Society for the Encouragement of Aerial Locomotion by Means of Heavier than Air Machines”. Nadar became the president of this society. His fame grew by leaps and bounds when he was asked by Napoleon III himself to take classic aerial photos for France during its war against Italy, but Nadar declined the service citing political reasons. 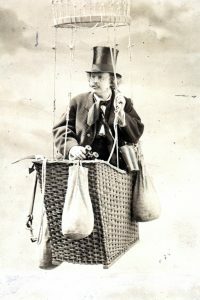 In 1870, Nadar helped Paris citizens by carrying important mail via air balloon to Normandy, when France was at war with Prussia. Thus, in a way, Nadar also initiated the global airmail service. Apart from aviation and photography, Nadar has also contributed to the art of painting. The introductory impressionist exhibition in 1874 was held by Nadar in his own studio. The exhibition promoted controversial art of Renoir, Cezanne, Boudin, Pissarro and many others. Nadar always championed the cause of numerous known and unknown artists and painters, as he believed in their work. His observation skills were very keen. His portrayals were accurate and seemed to be an exact version of his subjects. He turned photographer in 1854. Knowing that people were willing to offer exorbitant rates for the pictures or images of famous personalities, Nadar used this information to his credit. In his photos, Nadar gave a radiant luminous quality to the faces of his subjects with the trick of the light. Junior photographers were often astonished and fascinated by the bevy of celebrities who descended down at Nadar’s studio. All the stars who performed at Comedie Francaise visited his studio. During the 1890s, when Nadar lost interest in his business, he gave the reins to his son Paul. Nadar junior was allowed to carry forward his fathers prestigious legacy. Paul also showed promising talent and keen passion for photographing the social figures (late 19th and the start of 20th century). However, modern-day experts feel that photos taken by Nadar junior lacked the mental depth that was evident in his father’s pictures and portraits. Felix Nadar is considered as a photography legend by the French audience. Felix Nadar passed away in the year 1910. And in the year 1979, Nadar’s name was rightfully included in the International Photography Hall of Fame.